Next week-end sensei will not teach because of the Obon, a Buddhist ceremony of filial piety in honor of the ancestors of one’s family. This ceremony is held around mid August (it depends on the region of Japan and/or of the calendar in use solar or lunar) and is based on the Ullambana Sutra, one of the Sutra of the Mahayana Buddhism. What I find interesting here comes from a discussion I had the other day with Senô sensei before the class took place. 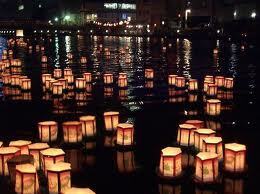 The Obon (or Bon) is a very important time for the Japanese people as this is a time where the spirits are there. It ends with the famous paper lanterns floating downstream and symbolizing the souls of the deads going back to their own world. 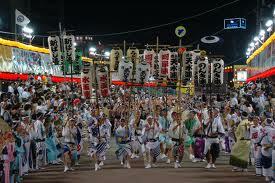 Even though the Obon is not a holiday, it is a custom to let the people honor their ancestors and not work on these days. 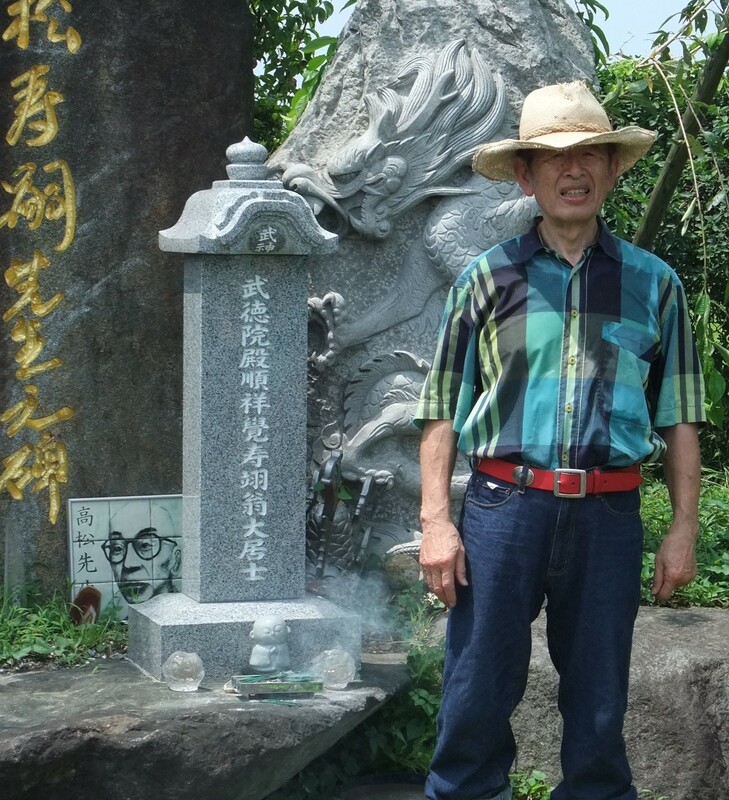 Honoring your ancestors, and filial piety are linked to the bujinkan in many aspects. When I was speaking with Senô sensei he used many times the word yûgen when speaking of the souls of the deceased; and also of the sanjigen (the third dimension). And these two concepts were the ones we studied respectively in 2004 and 2003 whe nwe entered the world (sekai) of juppô sesshô. When those concepts were taught by Hatsumi sensei we had no clue about their meaning and they looked like some esoteric concepts far from our concern. After all we come to Japan to train fighting techniques, no? In fact all through these last years Hatsumi sensei has been teaching us more than techniques, he has shown us the Japanese culture and shared with us his vision of the world as a Japanese. Without his very special way of teaching we would still be excluded from this world of understanding and our improvement in the bujinkan arts would be limited. This way of teaching made us go from childhood to adulthood without knowing it. Another interesting link to the bujinkan is the term sôke because its chinese origin (Mandarin Zongjia) conveys “strong familial and religious connotations. Etymologically it represents a family performing ancestor rites”. As always there are various meanings but one interests us more as the “sôke is the one responsible for maintaining the ancestral temple on behalf of the entire clan organization. In Japanese texts, sôke always implied a familial relationship replete with filial duty (but) the Japanese use of this word is not limited to consanguineous contexts” (from William Bodiford, UCLA). “Bujin” in Chinese is “Wusen” which is, as you know one of the nicknames given by the Chinese to Takamatsu sensei. Therefore the bujinkan is the “house of Takamatsu sensei. And this explains why Hatsumi sensei is using this specific term od sôke which is rarely used in the martial arts world. In fact, in my understanding Hatsumi sensei sees himself as the “son/heir” of Takamatsu sensei and he has developed the bujinkan in order to revere his memory. The other day when we went to sensei’s second house in Tsukuba we performed a ceremony in memory of Takamatsu sensei and we were asked by sensei to put incense sticks on his memorial. The love and respect of Hatsumi sensei towards Takamatsu sensei is obvious when you watch the dvd “Takamatsu Toshitsugu, the last ninja”. So if you are now in Japan do not be too sad if you have no training on Friday and Sunday because the spirit of Takamatsu sensei will be there with you for the whole week-end. 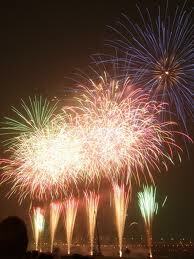 Share with the Japanese the joy of these two days where obori (obon dancing), fireworks and matsuri are held, and on Sunday night go to river outside of Noda and watch those beautiful paper lanterns going down the river to reach the sea. Previous Post Seiza or Seiza?